Three and Out for Pep’s Barça? Back in January I read this Jonathan Wilson piece for the Guardian Sport Blog that outlined how at the very highest level the greatest teams in history often only last a maximum of three years (especially those who played a pressing game) or ‘Béla Guttmann’s Three-Year Rule’ as also mentioned in Wilson’s excellent book Inverting the Pyramid. The piece was written following a draw against Espanyol that saw Barça fall five points behind Real Madrid in La Liga but having comfortably defeated their rivals in El Clásico in December and with them still being most people’s favourites for the Champions League. Fast forward three and a half months and with the end of the season approaching Barça now find themselves trailing by seven points in La Liga having just been defeated in El Clásico and having been knocked out of the Champions League by 10 men from a team that are currently only sixth in the English Premier League (twenty-five points behind Man Utd). 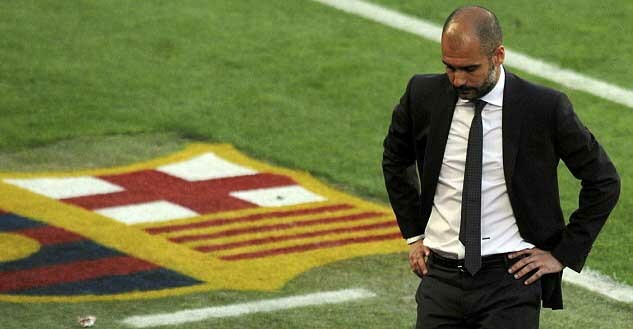 Barcelona 2008-11 (3 consecutive La Liga titles & 2 Champions Leagues under Josep Guardiola) ? Decay can have numerous causes. A shape-based game saps players because it requires constant thought, and because training to get the shape right is boring and repetitive. Pressing is physically exhausting, demanding perpetual running. Players living and working in close proximity for three years will start to get on each other’s nerves. And then there is hunger: when you’ve won a league title three times, does the fourth really matter as much as the first?.. …If they can kick on, if they can overcome Guttmann’s three-year rule, then their achievement will be truly historic; if it does all slip away, then they will merely have been another excellent team.